Hollywood's first adaptation of the famous events that helped shape marine history, Mutiny On The Bounty is a grand and ambitious seafaring adventure. Thanks to stellar performances, quality execution and the timelessness of the struggle against abuse of power, the film has lost none of its impact, and remains an exceptional achievement. The time is 1787, and English ship crew members are treated no better than slaves, often press ganged into service against their will and severely disciplined by pompous officers for the smallest infractions. 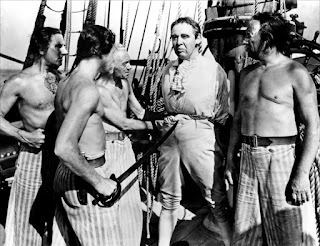 Captained by the authoritarian Captain William Bligh (Charles Laughton), HMS Bounty sets sail from Portsmouth on an arduous two year return journey to Tahiti. 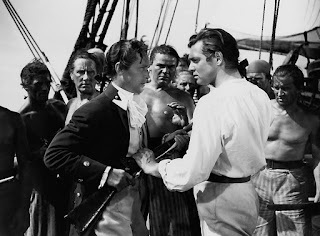 Fletcher Christian (Clark Gable), the Bounty's lieutenant, is more sensitive to the crew members' needs, and finds Bligh's methods distasteful. Also on board are inexperienced officers, including Fletcher's friend Byam (Franchot Tone). Bligh takes every opportunity to abuse, humiliate, and torture his crew members. After a long and difficult journey the Bounty arrives in Tahiti, where the men get a respite for a few months while the ship is loaded with supplies. Fletcher and Byam meet and fall in love with two local beauties. Soon after setting sail again, Bligh returns to his autocratic methods, and with memories of Tahiti fresh in his mind, Fletcher snaps. He seizes control of the Bounty, and casts Bligh and his loyalists adrift in a small boat. But for Bligh, Fletcher and Byam, there are many more choppy seas to navigate. Directed by Frank Lloyd as an adaptation of the novel (by Charles Nordhoff and James Norman Hall) that dramatized the real event, Mutiny On The Bounty is an ambitious epic, and an early milestone in what the cinematic art form can deliver on a big budget, with big stars and unconstrained ambition. The film quickly creates an impressive level of tension on board a relatively small ship sailing the high seas, and notably sustains the drama throughout the 132 minutes of running time. Lloyd divides the story into four tidy segments: pre-sailing, the journey to Tahiti, the stay on the island, and then the mutiny and its aftermath. Each segment serves its purpose, with the key characters introduced and rounded into individuals early on, the Captain's brutality emphasized on the long journey across the Pacific, the men exposed to an entirely different and enticing lifestyle in Tahiti, and finally emotions boiling over, swords drawn, and destinies and lives altered forever with an audacious act of mutiny. The script (by Talbot Jennings, Jules Furthman and Carey Wilson) keeps the drama at a simmering level through every chapter. While the epic scope of the film stands out, from impressive scenes of the Bounty traversing the ocean to the hordes of crew members populating every corner of the ship and then the natives bringing Tahiti to life, Mutiny On The Bounty draws its true power from the conflict between the three central characters. Captain Bligh is a phenomenal navigator but a hateful, antagonistic leader. Fletcher Christian is much more people-oriented and in tune with the needs of the common man. Byam is caught in the middle, drawn from the upper classes where he need not worry about the crew members, mindful of his position of privilege, but friends with Fletcher and easily able to appreciate other perspectives. 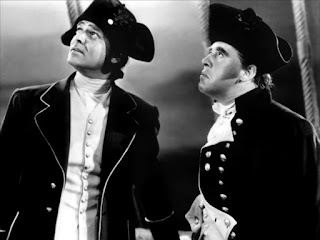 While Bligh and Fletcher will spin off in opposite directions as a result of their actions, Byam will be the most exposed both when the mutiny erupts and later at the court martial. The film presents life upon the open sea as a series of challenges to be overcome with bravado, muscle, perseverance and willpower. From severe storms to a lack of wind, days and weeks of boredom to brief moments of exhilaration when land is sighted, the rigours of long voyages on the ocean both compliment Bligh's skills and condemn his methods. The performances of Charles Laughton and Clark Gable (without a moustache) are an absolute delight. Both actors create men who strongly hold on to core beliefs in the face of terrible adversity. Laughton snarls his way towards making Bligh an authority figure worth despising, while Gable's charisma brings the idealistically heroic Fletcher to life as initially tolerant but ultimately forced into rogue action. Franchot Tone is unfortunately not of the same calibre and often seems overwhelmed. The cast also includes Donald Crisp, Henry Stephenson, and Spring Byington, while future stars James Cagney and David Niven are uncredited extras. Mutiny On The Bounty is a rousing saga, a transformational story told with artistry and conviction that has stood the test of time.